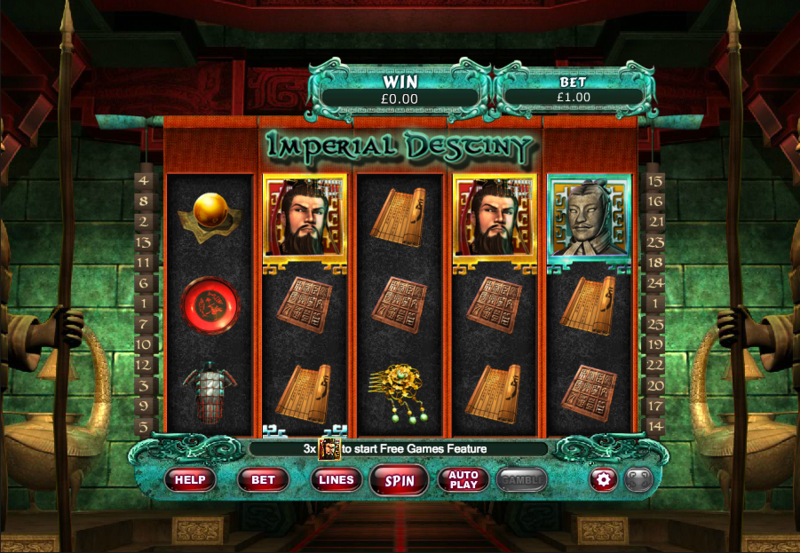 It’s fair to say we’ve reviewed more than a few oriental-themed online slots in our time but there’s always room for one more and so here we have Imperial Destiny, a game developed by Eyecon and based on Shi Huangdi, regarded as the first emperor of China. It comes with two separate bonus features and you can read all about it below. 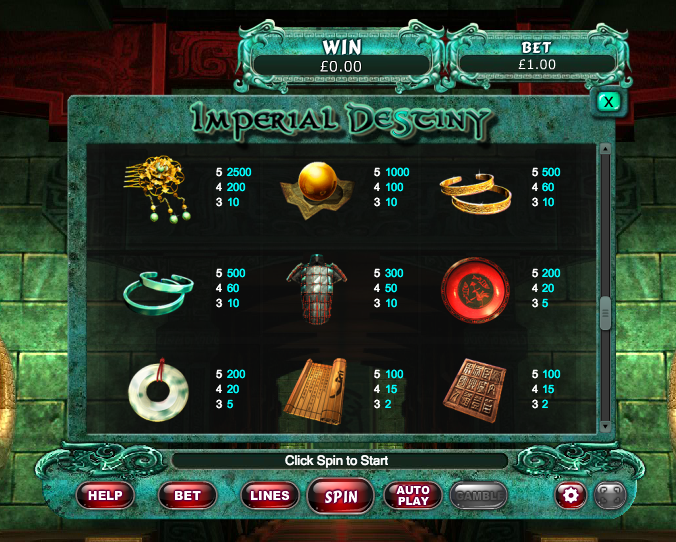 Imperial Destiny is a five reel slot with three rows and up to twenty five paylines; those reels are formed by large red banners surrounded by ornate jade and placed against a backdrop of a temple interior. The base game symbols are all related to the theme and include various bits of gold and jade jewellery, scrolls, printing blocks and armour. Shi Huangdi is the wild symbol and he appears only on reels two and four, substituting for all others except the two scatter icons – the stone warrior and the bell. This is triggered by landing three, four or five of the bell scatter symbols anywhere in view for which you will receive 15, 20 or 25 free spins respectively. The wild now appears on reels one, three and five and when it does it will expand to fill all reel positions. The spins can be retriggered up to fifteen times. Trigger this by landing three or more of the stone warrior scatter symbols anywhere in view; you will now get to make the same number of picks as scatter symbols landed and each pick will award up to 100x the total stake. Each win can be gambled by clicking the ‘Gamble’ button below the reels; it’s a double or nothing game with a limit of five correct guesses. Imperial Destiny is quite an atmospheric slot with some nice background sounds and two decent bonus features; it comes with an RTP of 95.30%.